Here is a lithograph which I picked up recently. No signature, no date, no identifying marks at all. So, why talk about this picture. Well. It could be up to 200 years old since lithography was developed in 1796 or it could be 30 years old, as well, I find the view and perspective of this drawing very unique. A town plan in 2D with 3D in aspects. It reminds me of images which I might find on ancient maps. How do I go from this point? How do I find out about this picture? First I note specific points in regards to the content in the picture such as: the fortress’s exterior wall encloses a city through which one need pass to access the keep(donjon). The keep sits on a mound(motte), is surrounded by a ditch, has a flat open area past the ditch(bailey) and entrance to the keep is granted by draw bridge. The town itself appears to be European in style due to the architecture, the roof style, and the roof tiles so thus Italian, Spanish, Portuguese, Maltese, etc. 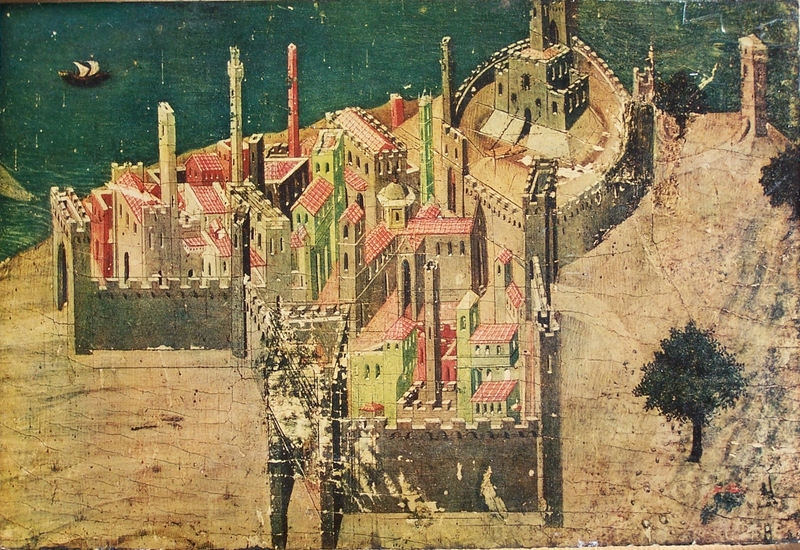 The building in the centre of the picture with the dome roof has a cross on it so Christian. It is on the coast in a dry arid place and the trees could be olive trees. The battlements are made for men and not canons. The ship has sails. and so on. Now, it is time to surf the web using the noted specific points already listed. With so little information it is basically guess work as to what might lead me to identify the artwork. The next photogravure is not so mysterious. It is signed although I have yet to decipher it and it is titled. It reads Rokim, Amsterdam. So this is the Rokim Canal with the clock tower of the Mint (Munttoren) in the background. I have looked at the web and have not yet decided as to when this print was done. The small pointed tower to the left of the Mint tower appears in early photographs that I’ve seen. The rectangular shape of the bridge tells me the image is later than 1910 since images then have a bridge with curved arches. The signature I continue to attempt to decipher. Hopefully I will find the artist. The quality of this image is wonderful. A couple of small stains but not much else to detract from the beauty. 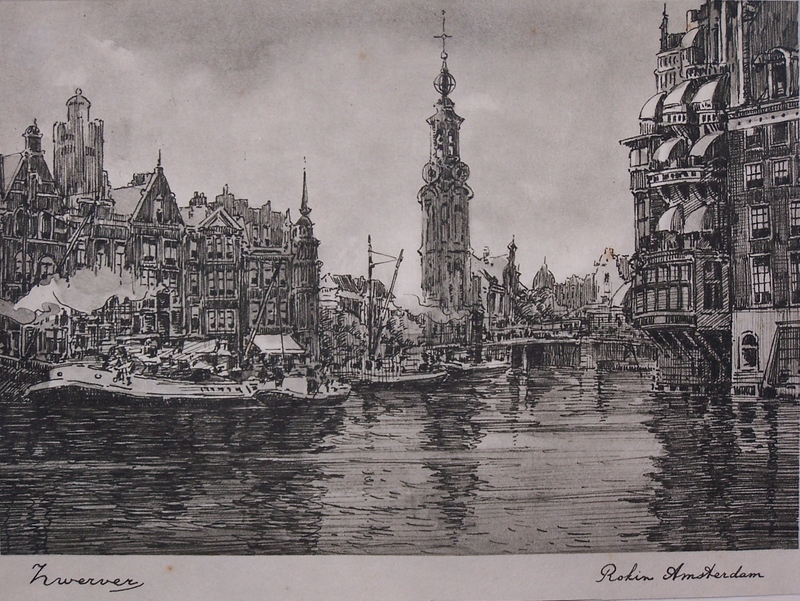 This entry was posted in Lithographs, Modern prints and tagged Amsterdam, boat, church, clock tower, drawbridge, fortress, keep, mint, motte and bailey, Munttoren, olive tree, Rokin canal, towers. Bookmark the permalink.